The Paddock Lake village government along with the Westosha Kiwanis Club will be hosting a Independence Day bike parade/celebration on July 3. 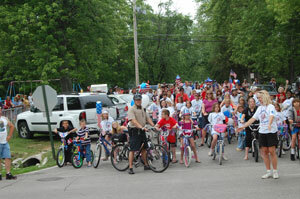 The bike parade will start at McAlonan Park at 10 a.m., riding along to Village Hall. All kids will receive a t-shirt and a coupon that will get them a hot dog, bun, bag of chips, drink and condiments provided by the Kiwanis when they get to there destination back across the street from village hall starting at approximately 11:15 a.m. The village will be providing a face painter along with a magician and the Kiwanis will be providing food, drinks and entertainment. Fun should be had by all. At dusk the Kiwanis will also be providing fireworks. “The village would like to thank the Kiwanis for their community spirit and their help to make this a great day!” said Trustee Karen Harris. Posted in: Events, Paddock Lake.